Full outfit details are at the bottom of the post. It was a rather brutal winter here in New York, so brutal, there was a snow storm of the first day of Spring. Nonetheless, I couldn't be happier that Spring is finally here, and to celebrate my excitement, I teamed up with Timberland to introduce some pieces from their new Spring Collection. Why am I doing the MJ dance move, you may ask? Well, the day I shot this look was the day I celebrated my 23rd birthday. See, there's a lot to be happy and excited about. 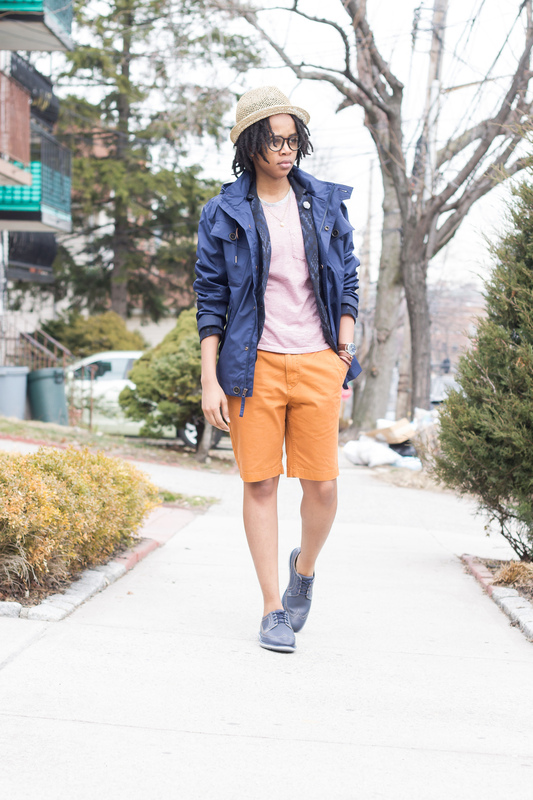 It's getting warmer, I'm getting younger, and Timberland is becoming fashion forward-er. I am loving it! To be honest, when I made the conscious choice to be dapper, I never thought for one second that I would wear Timberland again. (In high school, which I like to refer to as my "wannabegangsta" era, I owned a pair of big brown Timbs, and I wore them every chance I got). Now, It's a whole different ball game, they have reinvented their brand to cater to the modern gentleman and lady. You don't believe me? Go ahead and check their website, see for yourself, you'll be just as surprised as I was. Better yet, here's a link to my most recent collaborations with Timberland's refined look. This look is about the joy of life! Bright colors and bold patterns are springing to life. I chose to highlight the complimentary colors in this look: blue and orange. 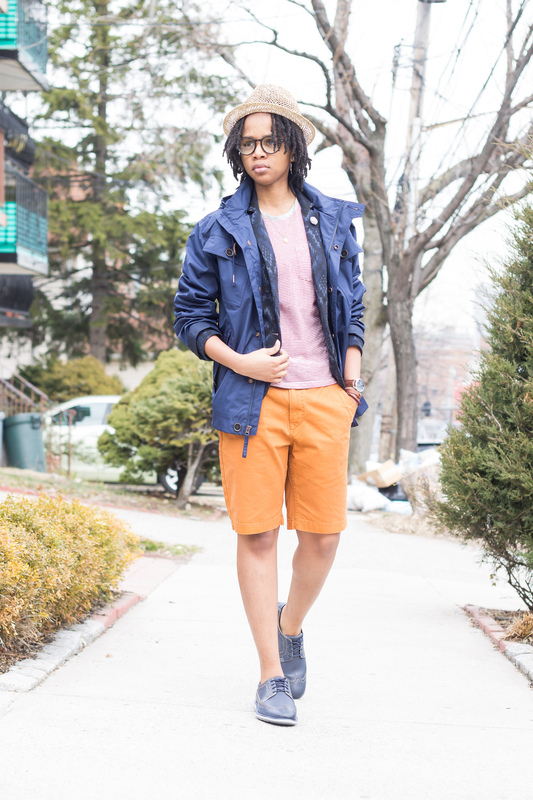 I'm wearing rudy orange shorts with a bold patterned, dark blue blazer. To add a little twist to the color scheme, I wore a red and grey striped t shirt. 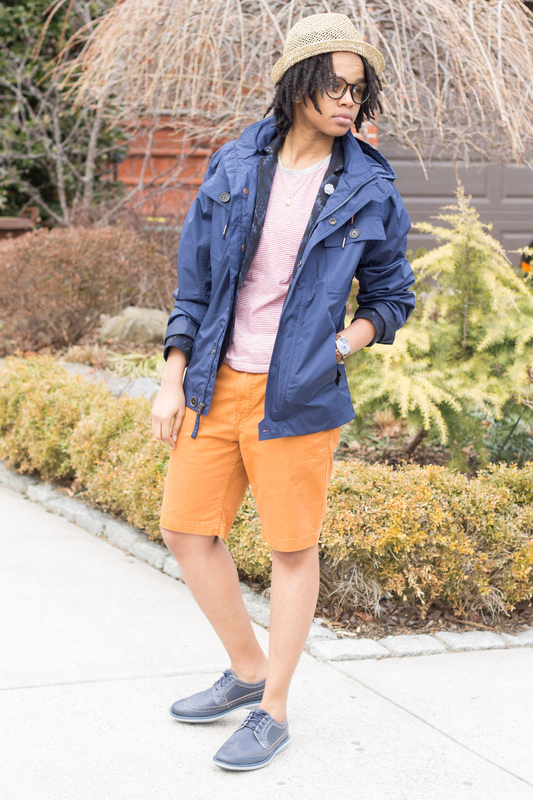 Tis the season where rain comes and goes, so be prepared with waterproof jackets like this navy blue one in the photos - it's light, roomy, and perfect for layering. I personally don't enjoy wearing shorts with socks that one can see, but it doesn't mean I'm sock less. Invest in good pair of no-show socks, and you'll thank yourself later. Lastly, stack up on the accessories, make it fun because after all, it is Spring. Don't forget, blue brogues for the win!